This recipe is so simple, so fast, and so good. When roasted, the carrots become tender and sweet, and the nubs of their tops caramelize. Serve them warm alongside roasted pork loin. Twist the tops off the carrots, leaving a 2-inch nub; wash and scrub the roots. 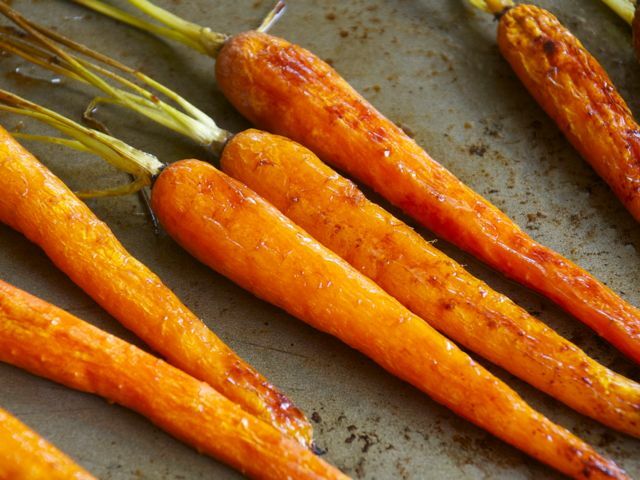 Place the carrots on a rimmed baking sheet and drizzle with olive oil. Roll the carrots back and forth to coat before placing in the oven. Melt the butter and honey together in a small saucepan and keep warm. Shake the carrots occasionally as they roast. Remove from the oven when they are browned in spots and a sharp knife easily pierces them but meets a bit of resistance at their core (15 to 20 minutes, less for very thin carrots). Drizzle the honey butter over the carrots, roll them around to coat, and place them back in the oven. Shake the baking sheet frequently and remove the carrots when their skin begins to caramelize and a knife easily slides through them, about 5 more minutes. Season to taste with salt and pepper.